After a busy winter day there is nothing better than coming home to a delicious, ready-to-eat meal. Yes! It’s time to dust off the crock pot! When gloomy weather has you feeling a little down, a warm and hearty meal can be so comforting. You can do all the prep in the morning, and dinner can be ready right when you walk in the door! Simply “Set It and Forget It”! Slow Cookers are wonderful way to utilize tougher cuts of big-flavored meat. Think juicy brisket, flavorful chili, spicy pork, or a delicious lamb curry. My recipe for Curry Chicken Thighs with Apples and Yogurt is a household favorite – it’s bursting with flavor! And crock pots aren’t just for entrees either – I also love to slow cook up a batch of overnight oats with brown sugar, orange zest and dried fruits. Top it with some Greek yogurt, or coconut milk – it’s the perfect way to start off a lazy Sunday morning! And the best part about these cozy meals? They make incredible leftovers! So turn on your crock pot and let d’liciousness simmer away! 1. In a large bowl whisk together the apple juice, cornstarch and flour until smooth. Then whisk in the curry powder, cardamom pods, coriander seeds, chili flakes, salt, sugar and yogurt. 2. Add the chicken to the marinade and stir to combine. Place the mixture in the slow cooker and add in the following order: onion, celery, currants or raisins, apples and bell pepper. Cover, set cooker to high and cook for about 7 to 8 hours. 3. Garnish with the fresh herbs. Serve with rice or potatoes. The cold weather months make us crave heartier foods… and root vegetables are definitely hearty. They are versatile in flavor, texture and application – as well as budget-friendly and a great source of complex-carbohydrates! 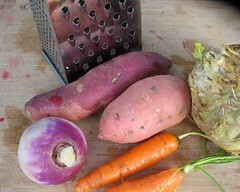 Rutabagas, parsnips, carrots, turnips and beets are all part of this delicious group. A great crop of root veggies! Roasted Beets are so tasty and star in my recipe with an Orange Cumin Glaze. Just pop whole in a 375 degree oven tented in foil and roast until fork tender – when cool the skins will slip off easy. I love them tossed in a salad with arugula, blue cheese, walnuts and balsamic vinaigrette. The often overlooked parsnip is also a fave – roast them whole with a chicken alongside a few of those beautiful rainbow carrots we see in the markets these days. It’s featured in my Creamy Roasted Parsnip Soup paired up with chevre and walnut croutons. Pour yourself a glass of Washington wine and you’re all set for a cozy meal. Speaking of parsnips and carrots – these also partner well simply steamed and mashed with some seasoning, butter, olive oil or sour cream for a tasty side dish alternative to traditional potatoes. Wash the beets and leave root untrimmed. Place beets on a large sheet of foil and seal like a package. Place foil packet on a baking pan and roast in preheated oven until very tender, about 1 hour and 45 minutes. Poke beets to make sure they are tender. As soon as beets are cool enough to handle, slip the skins off and slice into ¼-inch slices. In a small bowl mix together the orange juice, cumin, vinegar , honey and corn starch. Stir until cornstarch is well incorporated. Place liquid mixture in a large, non-stick sauté pan and heat over medium-high heat, whisking – while adding the butter and salt. Bring to a boil and add the sliced beets. Cook, turning beets as necessary, until they are hot and nicely glazed. Place on a serving platter or in large, shallow bowl. Mix together the walnuts, orange zest and parsley and sprinkle over the beets. You can prepare this recipe part way in advance: Just roast, peel and slice the beets ahead of time. This can be done up to 3 days in advance. Then finish the rest of the recipe procedure per instructions. These days it seems like life is extra hectic (especially with it being the holiday season!) and sometimes planning dinner can be last on your list. Thankfully grocers like Metropolitan Market, Whole Foods, and even Costco have you covered with their pre-made meals and dishes like their rotisserie roasted chickens. These chickens are great if you’re time starved. Of course they are d’lish just carved up and served as your main alongside tasty sides like roasted veggies, mashed potatoes, etc. But there is so much more you can do. 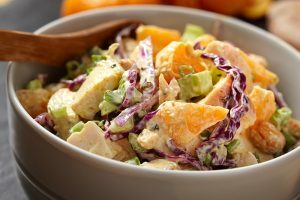 Add the meat to stir-fry, layer into quesadillas, build onto an open-faced sandwich, or make a Quick and Easy Chicken Mandarin Salad – the possibilities are endless. Once you have that chicken picked clean, don’t throw those bones away. Because next up is Homemade Chicken Broth! Add some carrots, celery, onion and the chicken bones to a big pot. Cover with water – if you want it extra rich, add in a can OR carton of chicken broth too. 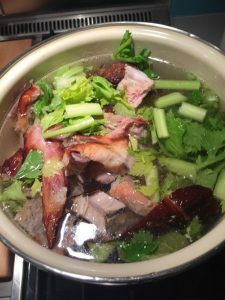 Homemade Chicken Broth – perfect for this chilly weather! Zest the lemon and set it aside, then juice the lemon. In a large bowl, mix together lemon juice and zest, curry powder, yogurt and mayonnaise. Mix in the chicken, cabbage, green onions, celery and nuts. Add the mandarin sections and season to taste with salt and pepper. Serve with pita’s or on your favorite mixed greens. 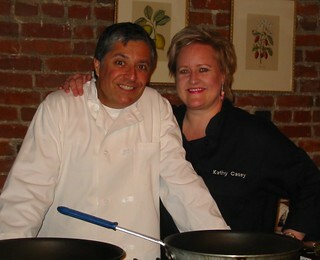 Ernie and I in 2004 Getting Ready to Cook Paella! I love teaching cooking classes. Sometimes, I focus on NW themes, like chowders, salmon and shellfish. Often, I teach tapas, gazpacho, paella or any combination thereof. My students are always attentive, sometimes passionate, and never dull. Recently, a group of students was preparing to head home after one of my summer picnic salads classes, and for whatever reason my Hispanic heritage became the subject of conversation. I suddenly found myself waning nostalgic, extolling the virtues of being raised in a bilingual and bicultural home. Soon, some of the classmates began to share their own experiences of visiting Latin countries; a few even demonstrated their Spanish-speaking prowess (keep in mind, it was a warm and lazy summer evening, rich in camaraderie, food and just a wee bit of wine). Inevitably, this sort of dialogue results in an exchange of favorite Spanish terms, cerveza (beer) ranking among the top 10, closely followed by the Spanish word for bathroom, baño. Occasionally, a naughty phrase or two is dispensed but on this particular night someone said the word “paella”. Surprisingly, even the non-Spanish speakers raised their hands when asked if they recognized this term. So, in the midst of a course on al fresco foods, the focus shifted to the dish most closely associated with Spain, paella. Interestingly, although my students recognized the word, very few of them could tell me much about paella—a dish as rich in tradition as it is ingredients. And so today, the topic is paella. Grab your dictionaries—we’re talking Spanish. “La paella” or “paellera” is a metal cooking utensil—a flat, wide and shallow pan with two curved handles on opposite sides. The word itself is old Valencian and it’s roots stem from the Latin “patella”, which, in Galicia, Spain, means a flat basket. Today, the word paella is synonymous with both the luscious rice dish and the vessel in which it is prepared. On the southeastern coast of Spain, below Barcelona, an area named El Levante is known as the Region of the Rices. The Moors brought the art of rice growing to this territory more than 1000 years ago, by establishing elaborate irrigation systems throughout the fertile deltas of the land. Understandably, rice has become a traditional staple there and it’s preparation, a delicious art form. As with most legendary foods, the origin of the dish called paella is hotly contested, yet the region most closely associated with this hearty stew remains Valencia. Thus, the title “Paella Valenciana”, which appears often in recipes and on menus. After rice became standard fare in Spain, the peasants of Valencia would prepare paella with common ingredients found in the countryside, such as onions, tomatoes and even snails. Occasionally, a rabbit or duck would be added and, when possible, a chicken or two. Eventually, the “Valencian rice” became widely known. By the end of the nineteenth century, “Paella Valenciana” had established itself. Today, tourists and locals alike will visit Spain’s restaurants and enjoy paella in its various interpretations. Some adventurous souls might even try their hand at preparing it at home. The basic foundation for true paella requires using short grain Valencian or Arborio style rice (the west coast equivalent being California Pearl rice), infused with saffron. Beyond that, the sky’s the limit. Paellas can be all vegetarian, strictly seafood, a meat lover’s smorgasbord, or any combination thereof. You can incorporate squid, langoustines, guinea hen and quail, and make it up as you go—though a tried and true Spaniard may cry foul and proclaim his to be the recipe for a traditional and authentic paella. Beware; this dish has been known to stir passions as well as appetites. Although the list of ingredients may seem exotic and somewhat daunting, ask anyone who has made a paella or two and they’ll tell you—preparing paella is a Spanish piece of cake. Think about it: paella is a one-dish meal, it’s the perfect party food and it feeds a small tribe. This traditional, pre-Colombian, Gazpacho came from southern Spain’s Andalucía region, where almonds and grapes are grown. For centuries it was a common meal for the poor and working class, who grew most of the ingredients themselves. Then, when the rare and expensive products of the Latin American “New World” (tomatoes, bell peppers and cucumbers) were brought to Spain, the wealthy added these new vegetables to the dish and gave it an upscale edge. They also turned their backs on the more traditional white Gazpacho, and never looked back. This started a new wave of cooking in Western Europe, and made popular many of the foods we still enjoy today. Pour 2 cups water over bread and let soak for 5 minutes. Drain. Squeeze bread until dry. Transfer bread to food processor. Add oil, vinegar and garlic purée. Season with salt to taste. Add almonds and ½ cup ice water, and blend until smooth. With machine running, gradually add remaining 2 cups ice water. Taste for salt. Cover and refrigerate at least 8 hours (the flavors need to blend) and preferably over night. Serve chilled, mixing well before serving. Garnish each serving with grapes. Cut the reserved pieces of rabbit (or chicken) into small pieces through the bone (or ask your butcher to do this for you). Dust the pieces with flour and 1 teaspoon salt and pepper. Heat olive oil in a paella pan or large heavy skillet on medium heat, and cook until crispy-brown and tender. Set aside. Add reserved shrimp and chorizo to the same pan, cooking until shrimp turns pink. Remove from pan and set aside. Add minced onion, remaining 3 cloves minced garlic, pimiento and tomatoes to the pan and cook until the onion is tender. Add the rice to the onion mixture and stir to glaze. Bring the reserved stock to a boil and add to the rice mixture. Add clams, squid and mussels, bringing to a boil, and simmer for 5 minutes. Add the peas and green beans, and cook 5 minutes more, uncovered. Arrange the rabbit, shrimp and chorizo atop the rice, amongst the squid and mussels. Cover the pan and place over hot coals or low heat on the stove, or in a preheated 400°F oven for 30 to 40 minutes, or until all liquid is absorbed. Serve with a crusty bread and Rioja wine. NOTE: To peel tomatoes, cut an “X” at stem end and on the bottom. Plunge into boiling water for 30 seconds to 1 minute. Remove immediately and plunge into iced water. Skin should slip off easily. This rich, rustic Cantabrian confection has a delicate spice-cake quality and somewhat of a pudding texture. It may be served warm or at room temperature. 2 3/4” high sides. Dust pan with flour. Melt butter in heavy large skillet over medium heat. Add apples, cover and cook until tender, about 8 minutes per side. Using slotted spoon, transfer 16 apple slices to processor. Add applejack and purée. Add flour, sugar, eggs, milk, baking soda and cinnamon and just combine until blended. Do not over mix. Pour batter into prepared pan. Drain remaining apple slices and arrange atop batter in a circular (star-burst) pattern. Bake until tester inserted into center comes out clean, about 50 minutes. Transfer to rack to cool. MEANWHILE, PREPARE GLAZE: Stir jam and applejack in small pan over medium heat until jam melts, about 1 minute. Brush some of glaze over warm cake. Cool cake 30 minutes. Release pan sides. Heat remaining glaze and brush over cake. Dust with sifted powder sugar. A Little Spice is Always Nice! Cinnamon, nutmeg, allspice, cloves… It’s time to spice it up! We love these spices in tasty cookies, cakes, and muffins. And there are even more dishes out there ready for that hit of warm spice pizazz! One of my favorite and somewhat un-sung spices is the cardamom seed. This flavorfully potent spice is native to India, but its flavor and use has spread throughout the world, from Scandinavian to Middle Eastern cuisine. Cardamom adds a sassy flavor to my Spiced Squash Bisque. 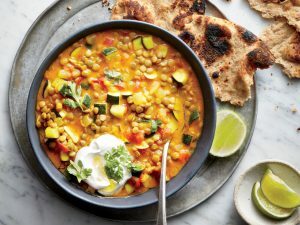 The aromatic spices combine well with the flavor of sweet winter squash making this soup a great cold weather dish. Other favorite spices that I love are allspice and cloves, so great in spiced shortbread cookies, stews – and I especially love them infused in my recipe for Spiced Red Vermouth … perfect in a Manhattan!! 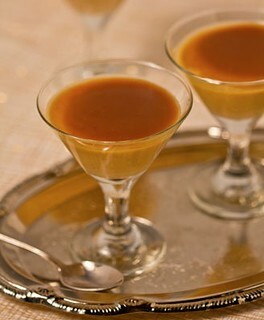 For the recipe and more inspired sipping, check out Kathy Casey’s Liquid Kitchen™. Rubs are another great way to incorporate new and unique spices into your meal. There are so many great pre-made options available like my Fragrant Star Anise Rub. It’s an excellent way to add an exotic flair to a roasted pork or chicken. If you like to experiment with creating your own rubs, check out the bulk spice section at your neighborhood grocer, or head on over to Pike Place Market’s World Spice shop to pick out what you want. World Spice has tons of loose spices, and you can buy just what you need, whether it’s a pinch or a squiggle. You can also find spices online from BulkFoods.com to Amazon. One last hint: a coffee grinder is excellent for grinding your own spices. Just be sure that you keep one for solely that purpose… the star anise “scented” coffee at my house was not a big hit! Organic or homegrown squash is preferable to use for this recipe because it creates a much more pronounced and sweet flavor. I like to use hubbard, Danish, or butternut squash, or a combination. Make the Crispy Seeds while the soup is cooking. In a large heavy saucepan, heat the olive oil over medium-high heat. Add onion and sauté for 2 to 3 minutes. Add squash, garlic, spices, bay leaf, and salt. Sauté for 2 to 3 minutes. Add chicken stock and bring to a boil. Turn down the heat, partially cover the pan, and simmer for approximately 15 to 20 minutes, or until the squash is very tender. Meanwhile, make the Crispy Seeds: preheat oven to 375 degrees F. Rinse seeds under cold water to remove any squash flesh or strings. Drain well and measure. Place in a bowl and toss with the olive oil. In a small bowl, combine cumin, sugar, and salt and sprinkle over the seeds. Toss well and spread seeds on a nonstick baking sheet. Roast for 8 to 10 minutes, or until crispy and toasted. Remove bisque from heat. Remove and discard bay leaf. In a blender or food processor, carefully purée the hot soup in small batches with the sour cream. (Be careful not to make your batches too large, since the soup is very hot.) Taste for seasoning and add salt as needed, especially if using homemade broth. Pour the puréed soup back into the pan and keep warm. Divide the soup among warmed soup bowls. Sprinkle each serving with about 2 teaspoons Crispy Seeds. For a vegetarian version: substitute vegetable stock for the chicken stock. For a fun and impressive presentation, thin out a small portion of sour cream with milk or cream until it is a “squeezable” consistency and put in a squirt bottle. Swirl the top of each serving with the sour cream. Gazpacho is traditionally known as a cold-style soup. Originating in the southern regions of Spain and Portugal, this fresh tomato-based soup is a summer staple and a refreshing to get your vegetables! I like to add lots of veggies into my gazpacho like cucumbers and bell peppers, then top it with some Alaska King Crab for a real splurge like my recipe I did with Sunset Tomatoes. Just think you won’t even have to turn on the stove for an elegant meal – that is definitely a plus on a hot summer’s night! Photo by Kathy Casey Food Studios®. Tomatoes aren’t the only celebrities when it comes to “cold” soups …… there are lots of chilled summer fruit soup recipes too! Juicy, ripe melons are the star in my Thai Chilled Melon Soup with Shrimp and Fragrant Herbs. Creamy coconut milk, bold Thai red curry paste, and zesty ginger and lemongrass come together to make this soup d’lish. Top it off with a pouf of sweet bay shrimp and crunchy water chestnuts. Then season it up with a hit lime juice, basil and mint – it’s the meal to cool off with! Yum! Chilled Bing Cherry Soup is a summertime classic in Scandinavia and Eastern Europe; mostly served as an opener. I’ve dug out the old recipe I used to make every summer at Fullers. Lush ruby cherries are cooked with spices and white wine then chilled, pureed and topped with a swirl of crème fraiche or sour cream. Savory, sweet and lush –mmmmm! In a food processor or blender, process the cantaloupe, sugar, ginger, lemon grass and curry paste until evenly pureed. Mix in the coconut milk, salt and lime juice. In a small bowl, mix the topping ingredients together. Ladle soup into small bowls and spoon a pouf of topping into each serving. Garnish with cilantro sprigs. Pass lime wedges on the side. Recipe by Kathy Casey Food Studios®. I also like this soup topped with a few coarse chopped toasted hazelnuts for a touch of crunch. In a medium saucepan, combine the wine, water, sugar lemon zest, spices, peppercorns, and salt. Bring to a boil over medium-high heat. Add 5 cups of the cherries (reserve remainder) and bring back to a boil. Reduce heat to a simmer, and cook for 5 minutes. Remove from the heat and let stand till mixture reaches room temperature. When cooked cherry mixture is cool, remove and discard cardamom pod and cinnamon stick. Place cherry mixture in a food processor or blender, and process until smooth. Then add crème Fraiche, and process until smooth. Chill soup till very cold, at least 4 hours or, preferably, overnight. Serve well chilled in cold bowls. Garnish each serving with the reserved, pitted cherries divided evenly among servings. Swirl the top of soup with thinned crème fraîche or sour cream drizzled from a spoon or squirted from a squeeze bottle. Garnish with edible flowers if desired.